Do you have any Greathouse kith and kin who resided in Germany? If so, please join us in our efforts to better document the locations in Germany where Greathouse kith and kin ancestors lived, by sending your additions and corrections to Greathouse Point. Harman Grothaus and Anna Maria Hemmers were married at the Evangelic Church of Rheda, Techlenberg in 1653. In 1764 Johannes Herbergs and Peter Heinrich Strepers traveled from Germany to Pennsylvania to recover property which their grandfather had bought in 1682 from a representative of William Penn. Johannes wrote a journal, now in possession of the Rheinishces Freilichtmuseum Kommen. 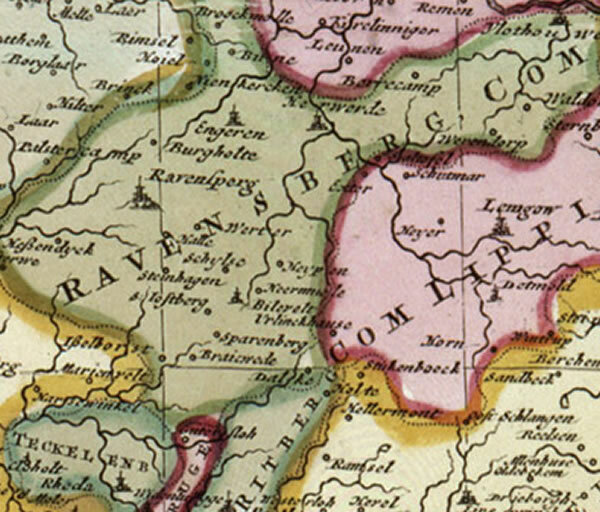 The journal mentions a visit to Jan Grothaus, whose father Hermen had come to America from Bielefeld about 1714. Initial efforts to locate Herman Grothaus in the Bielefeld church records were unsuccessful. In November 2015, while, while Thomas Hutzelman of Eerie, PA was searching an online archive of church records of the surrounding parishes of Bielefeld, he found the records of the family in the parish of Gross-Dornberg, the next town west of Bielefeld. 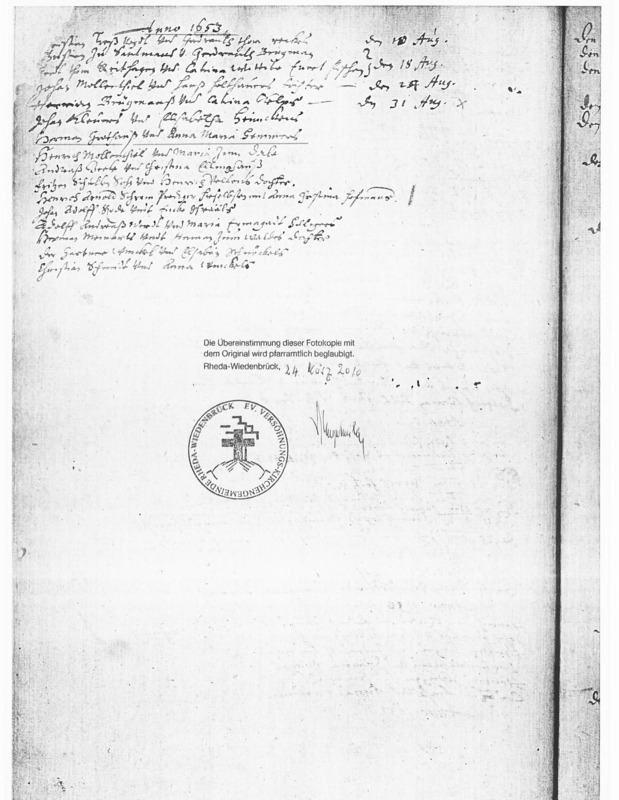 Birth/baptismal and confirmation records for our Herman Grothaus and several of his children, including Heinrich and his twin Alff, born on 9 Jan 1695, and Johann Adolph, born on 12 Aug 1696, were found in the records of the Evangelical Lutheran Church at Kirch-Dornberg, located west of Gross-Dornberg. Further correspondence between Thomas and researchers in the Bielefeld area yielded the records of Pastor Kenter in the Bielefeld Evangelical Church Archives, which enabled us to trace the family of Herman Grothaus back into the mid-1500s. The discovery of birth/baptismal and confirmation records for our Herman Grothaus and several of his children found in the records of the parish church, St. Peter's Evangelical Lutheran Church, located in the village of Kirchdornberg, has revealed that Pastor Schlegelmilch was mistaken to conclude that Herman and Anna Maria Hemmers Grothauss who were married at the Evangelical Lutheran Church of Rheda in 1654, were the parents of our Herman Grothaus who immigrated to Springfield, Philadelphia County, PA, by 1710. While Pat was visiting the Evangelical Church, she was able to obtain copies of the marriage certificate of Herman Grothauss and Anna Maria Hemmers. She also met a retired pastor of the Lutheran church, Pastor Schlegelmilch, who does genealogical research for a hobby. During the interview with Pastor Schlegelmilch, he concluded that Herman and Anna Maria Hemmers Grothauss were the parents of our Herman Grothaus who immigrated to Springfield, Philadelphia County, PA, in 1710. Pastor Schlegelmilch further related that the grandfather of our Herman was Johann Grothaus. The Pastor proceeded to relate that our Herman had a brother named Johan who must have been older than Herman . There may have been other siblings in between Herman and Johan but the names of such siblings were unknown. As it was the custom to name the kids with the same name as parents and grandparents, this leads to a bit of confusion. The retired pastor then shared that Anna Maria Hemmers was from Rheda (a beautiful little town with white and black Tudor half-timbered houses....Rheda being Protestant and Wiedenbruck being Catholic, also lovely with Tudor houses) she then would have moved to her husband's home, which must have been somewhere near or in Bielefeld. Pat further shared that they had no luck finding other records at the Bielefeld Archives. It seems that the church registrars were better kept than the archives at that time due to the Thirty Years' War, in which many records were destroyed. One would have to rely on private families and their Bibles. I haven't given up yet as I still have the Immigration House in Bremerhaven, which I will attack in September when I come back from Maine. Evangelische Kirche (Rheda, Westfalen, Preussen), "Kirchenbuch, 1622-1961," Marriage of Herman Grothauss and Anna Maria Hemmers. Thomas Hutzelman, Correspondence to Greathouse Researchers, Subject: Grothus records in Bielefeld area, November 2, 2015. Pastor Schlegelmilch, Evangelische Kirche, Rheda, Westfalen, Germany, interviewed by Pat Schulze, 15 Jun 2010.